The Mercer Family Foundation donated $2 million to conservative think tanks that seek to influence public opinion about climate change in 2016, according to its most recent tax filings. The foundation donated to the Heartland Institute, Heritage Foundation, CO2 Coalition, Center for the Study of Carbon Dioxide and Global Change, Oregon Institute of Science and Medicine, and Cato Institute. A number of those groups are influencing environmental policy in the White House, U.S. EPA, the Interior Department and other areas of the Trump administration. The heads of two of those groups have been discussed as the potential science adviser to President Trump. The growing financial support shows that the Mercer family, which donates to a variety of conservative causes, is branching out to more groups opposing climate action, said Kert Davies, of the Climate Investigations Center, an advocacy group that obtained the Mercer Family Foundation tax forms. As other funders, like Exxon Mobil Corp., have walked away from funding controversial climate groups, the Mercers have become their "lifeline," he said. "There would be no space in the dialogue about climate change for denial and the propagation of that message through right-wing media and the echo chamber that is Breitbart and Rush Limbaugh and Heartland and all these different outlets without this money," Davies said. While the family has donated to conservative causes for years, the tax forms show that the Mercers broadened their support for groups that cast doubt on long-established climate science during the presidential election year of 2016. Both the CO2 Coalition and the Center for the Study of Carbon Dioxide and Global Change were new recipients of Mercer money. The Mercers were major donors to President Trump's campaign and are credited with helping to elevate Kellyanne Conway and Steve Bannon into key advisory positions. Bannon left the White House last summer. 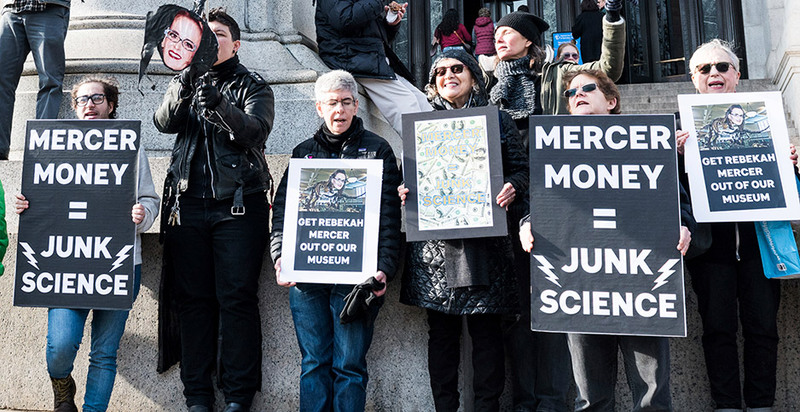 Yesterday, a group of 200 climate scientists and activists released a letter demanding that the American Museum of Natural History in New York City remove Rebekah Mercer from its board of trustees because her family has donated to organizations that attack scientists. The push was organized by the Natural History Museum, an advocacy group that led a similar drive to push David Koch off the board of the Smithsonian's National Museum of Natural History. Koch stepped down after scientists and advocates called for his ouster, but he insisted it was not because of political pressure. "The most important asset any museum has is its credibility," the scientists and activists wrote. "This can be damaged by ties to donors and board members who are publicly known for investing in climate science obfuscation and opposing environmental solutions." In the last decade, the Mercer Foundation has donated millions of dollars to the Heartland Institute, which promotes the claim that humans are not the primary drivers of climate change. In 2016, the foundation gave $800,000 to Heartland, making it one of the group's biggest donors. Rebekah Mercer and her billionaire father, hedge fund manager Robert Mercer, attended the Heartland Institute's annual climate conference in Washington, D.C., last year. Later, U.S. EPA reached out to the Heartland Institute for a list of researchers who reject mainstream climate science for openings on the agency's science advisory boards. The Mercers have also ramped up funding to lesser-known groups that promote the notion that increased carbon dioxide will benefit the planet and that burning more fossil fuels is good for humanity. That includes the CO2 Coalition, which received $150,000 in 2016. The group was founded by William Happer, an emeritus physics professor at Princeton University who is in the running to be Trump's science adviser. Another member of the CO2 Coalition is Kathleen Hartnett White, who has been picked by Trump to head the Council on Environmental Quality. Her nomination is currently stalled in the Senate, in part because of her views on climate change. She claims that carbon dioxide is not a pollutant, and it's unclear if she has enough Republican votes to be confirmed. Happer has referred to his group as a "CO2 Anti-Defamation League" and said it was necessary to counter the vast array of climate science finding that the rise in atmospheric carbon dioxide could endanger future generations. "The degree of understanding advances over time as people get better at measuring things and understanding things, but that's not true of climate science," Happer said. "Climate science was given an answer that was politically correct, and the job was to come up with arguments for why it was correct." The Mercer Foundation also gave $125,000 to the Center for the Study of Carbon Dioxide and Global Change, which has claimed that the world food supply could be threatened unless more CO2 is released into the air. The group is headed by Craig Idso, whose name was submitted by EPA as a finalist for one of its science advisory panels. The Mercer Foundation also gave $500,000 to the Heritage Foundation, which recently hosted a daylong event featuring panels of researchers who deny mainstream climate science. Heritage also works on issues outside of the environment, like economic policy. Both Idso and Happer have complained that their organizations are up against well-funded environmental organizations, such as the Sierra Club, which brings in millions of dollars in donations. Another organization funded by the Mercers is the Oregon Institute of Science and Medicine, which received $200,000 in 2016. The group is headed by Arthur Robinson, who was recommended to Trump as a possible science adviser by Rebekah Mercer. Robinson is a member of Heartland's board of trustees and has spent the last few decades claiming that higher levels of CO2 would benefit the planet. He and his family are also collecting thousands of vials of urine and freezing them to "revolutionize the evaluation of personal chemistry." Researchers favored by the Mercers have a common thread, said Davies, the climate advocate. They tend to argue that more CO2 is needed and that it will benefit humanity. Most of them don't have scientific backgrounds in climate science, he said. "These are the people on the fringe of the discussion," Davies said. "They have other expertise, and they've jumped into the climate fight as naysayers."